Now in its 16th series, Alan Carr’s guests have included Justin Timberlake, Lady Gaga, Robin Williams, Pharell, Britney Spears, Cameron Diaz, Taylor Swift, Vin Diesel, Adele, Justin Bieber, Bette Middler, Drew Barrymore, Lionel Richie, David Walliams, Mariah Carey, Russell Brand, Samuel L Jackson, Miley Cyrus, Rihanna, Bette Midler, Sharon Osbourne, One Direction and Miranda Hart. The BAFTA-winning series has encompassed one-off specials, Alan Carr’s Specstaculars, to celebrate special events such as New Year’s Eve and the Grand National. Alan Carr: Chatty Man is broadcast internationally, in Sweden, Norway, Finland, Canada, Denmark, Australia and South Africa. Series 16 was broadcast from March-May 2016 and a Christmas Special in December 2016 and 2017. 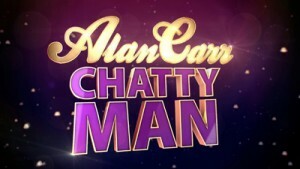 Catch up with Alan Carr: Chatty Man on Channel 4’s website.